Hello! Happy DieCember with Simon Says Stamp! This month is all about celebrating die cutting - and there is, of course, a fabulous NEW DieCember RELEASE for the occasion as well! You can check that out HERE! 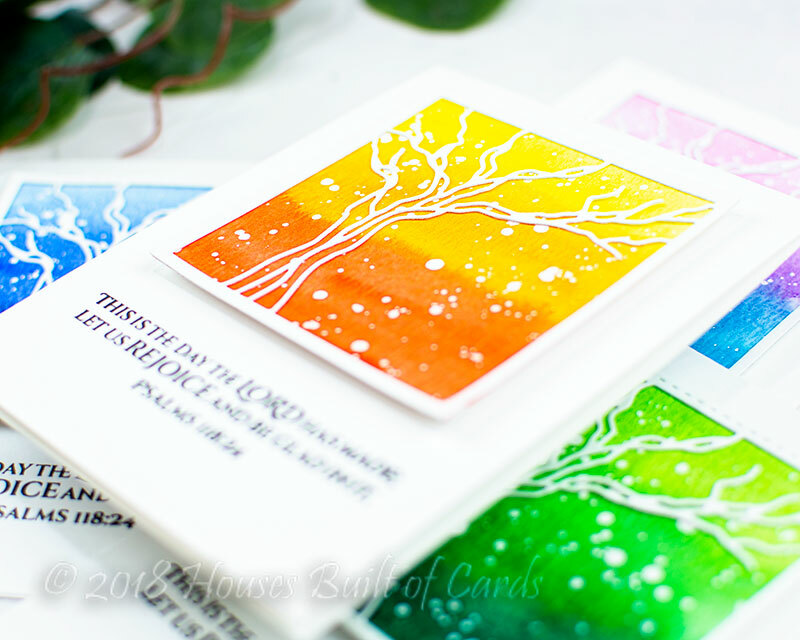 I'm kicking off the month by sharing this set of watercolor cards featuring the beautiful new Tree Frame Wafer Die! 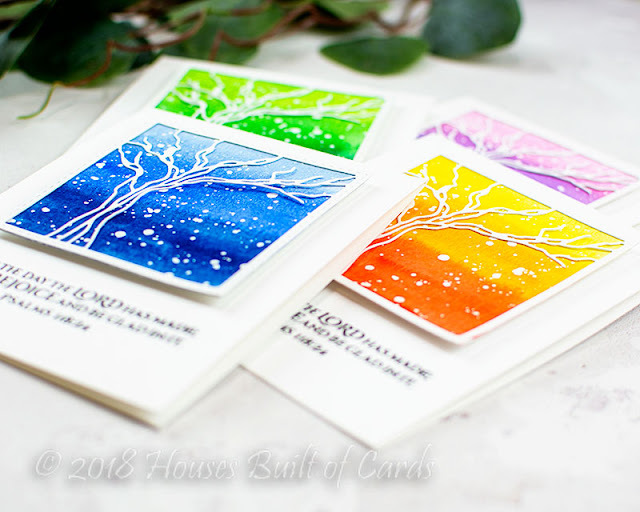 Make sure and check back on Sunday for the first day of a 2 day blog hop to celebrate the month - I am SUPER excited to share my cards for that! LOVE how they came out! 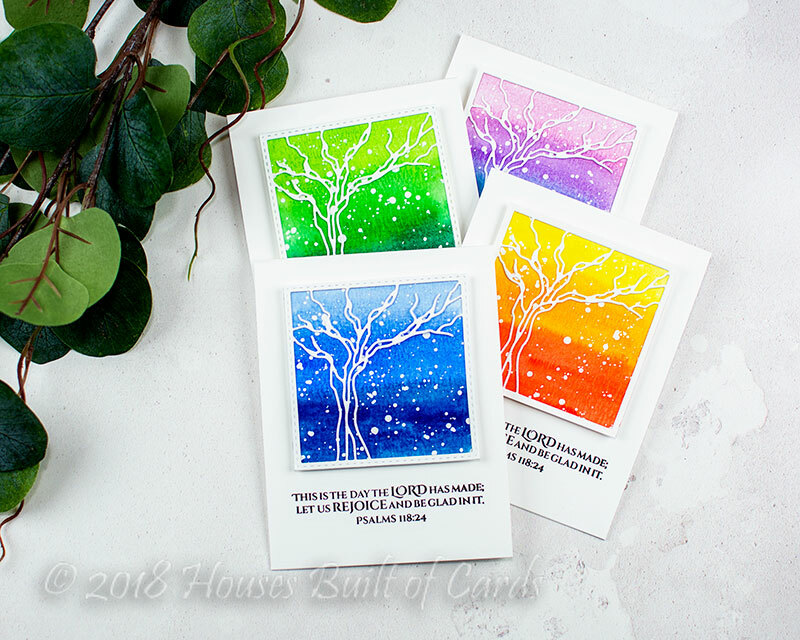 For these cards, I created several simple ombre watercolor backgrounds, just using random colors that looked fun as I did each one. No rhyme or reason, just playing with watercolor - so relaxing and fun! Once those dried, I added some white paint splatters to each panel. 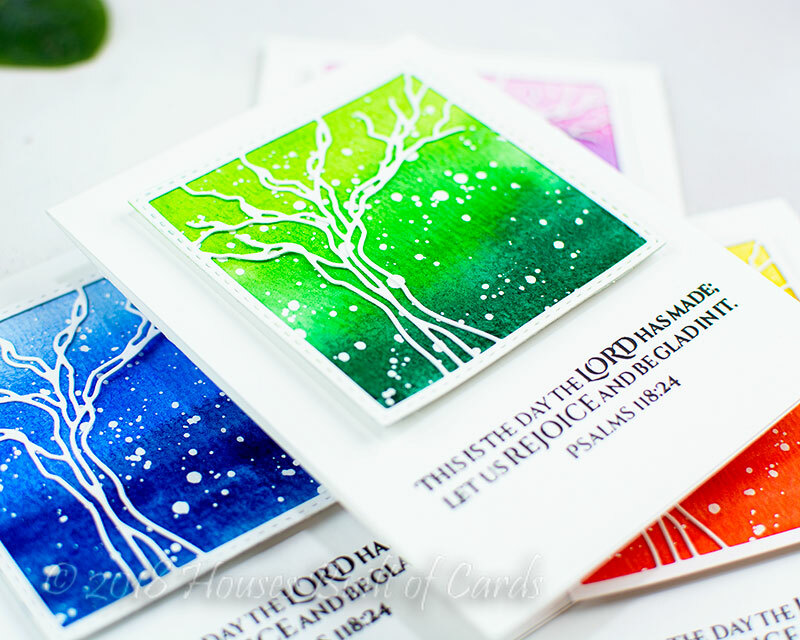 I die cut the Tree Frame Wafer Die 4 times from white cardstock. For two of these cards, I trimmed the panel down with my paper trimmer, and for the other two I used Stitched Squares - the second to the largest size was PERFECT to trim around the edges of this! I also used that same square die to trim down my watercolor panels, then layered those together, then mounted with foam on white cardbases. 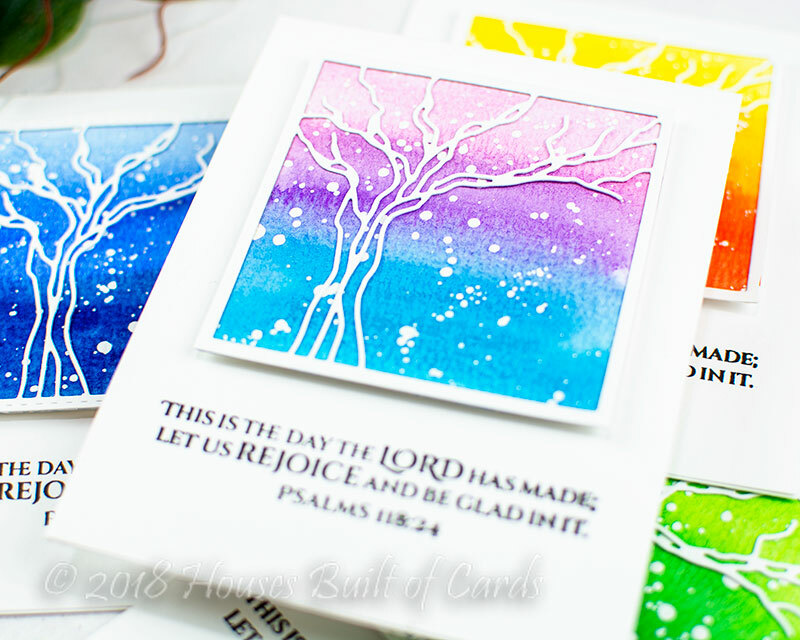 I stamped a sentiment on each one using Let Us Rejoice - and they are simple and ready! Now I did notice something kind of funny when I finished...noticed how the color schemes almost seem to fit and reflect a certain season on each one? Totally unplanned - but I thought it was kind of neat how it worked out! Beautiful cards! The tree frame die cuts look just gorgeous on your watercolor backgrounds. Hello Heather. What different cards! I love those pretty, delicate colours in your candy cards - so soft and sweet (no pun intended), then the fabulous colours behind the tree die. Love so many of these dies for the December release, but they will have to wait unfortunately. The colours aren't just ordinary water colours are they? 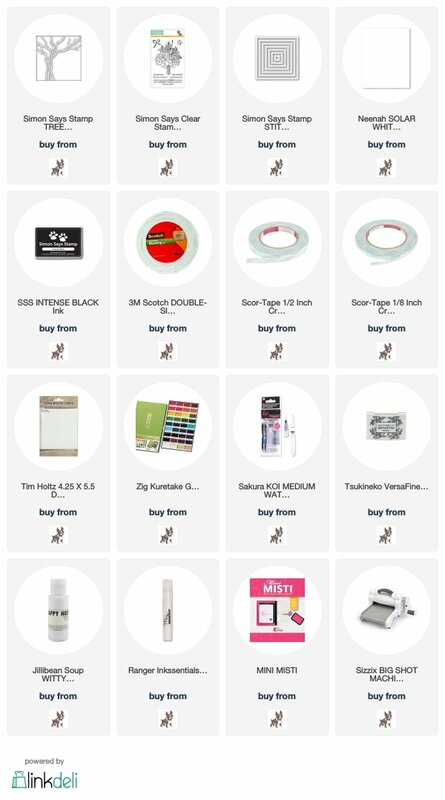 The pigment is too rich and deep to be just any brand, so I'm really going to have to save up for these expensive ones to be able to get the fabulous result you did. Thanks so much for the inspiration, I truly love how you "play". TFS. Wishing you and yours a very blessed Christmas. Bev. I really love these! The colors are awesome and the sentiment is perfect! Love the sucker cards from the swirl die. The tree silhouette is so striking against your backgrounds. Another great use of the tree die! Love the cards & the verse with them. I absolutely love your backgrounds!! 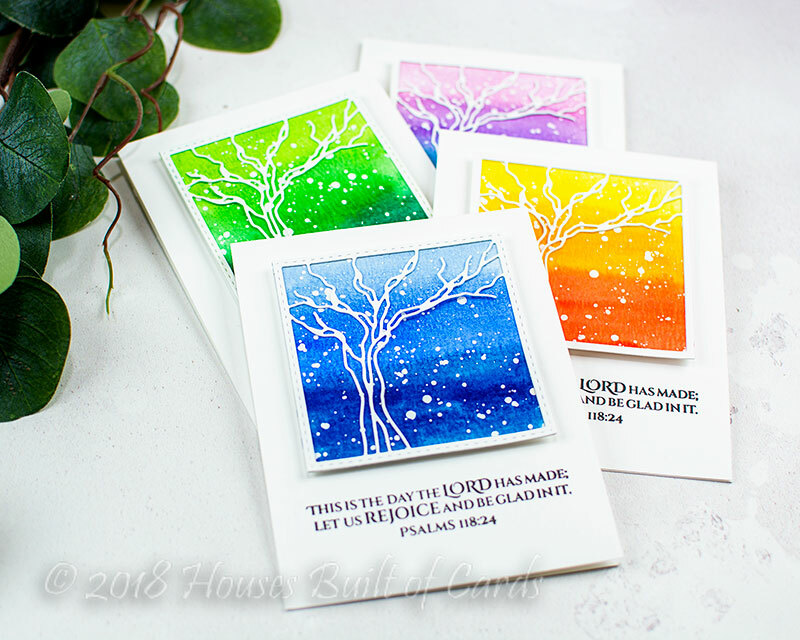 The use of the tree die is fabulous!! Beautiful cards! !